TASHKENT — Hopping to attract more tourists, the government of Uzbekistan will introduces electronic visa (e-visa). The e-visa will be issued for a period of 30 days and will be valid for 90 days (from its date of issue). E-VISA.UZ platform, the official web portal, operates in several languages including Uzbek, English, Russian, among others. On the portal, applicants can check the status of their application via an unique identification code provided to them. The time for registration and issuing of e-visa will be two working days (doesn’t includes the day application was filed). The consular fee is $20. The authentication of an application can either be done by using e-mail address or other identifiers like mobile number or account in social networks. The validity period for an under 16 foreign citizen, accompanied by a legal representative, having an international passport/biometric travel document, is the same as of the accompanying person. 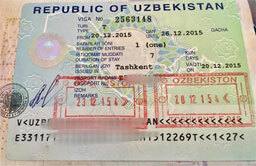 However, he/she cannot stay for more than 90 days from the entry date in Uzbekistan. And if foreign citizens turn 16 during their stay in Uzbekistan, there will be a provision of exit visa that will be issued by the migration and citizenship registration offices in the country. In addition to introduction of e-visa, the 5-day visa-free transit procedure will also begin for 101 countries from 15 July 2018. However, it is required for citizens to have an air-ticket to a third country, and the airline must give all the information about passengers to the border authorities of Uzbekistan. The visa-free regime also extends to holders of Brazilian, Chinese, and Vietnamese diplomatic passports. An agreement on mutual non-visa travel for holders of diplomatic passports with Kuwait was signed in February 2017 and has not yet been ratified.